Jiggles went to his orchard every morning to tend to the fragrant oranges. The rabbit picked one and sniffed it before peeling the rind off and biting into the juicy sections. Jiggles loved oranges. Farny went to his orchard every morning to tend to the fragrant lemons. The rabbit picked one and sniffed it before peeling the rind off and biting into the juicy sections. Jiggles loved lemons. The orchards stood next to each other and some branches grew over the fence into each other’s orchards. One morning, just after the sun rose over the horizon, Jiggles went to his orange orchard. He gasped when he saw Farny picking one of his fruit. “What do you think you’re doing? Those are MY oranges, not yours. How dare you!” Jiggles marched over to the fence and picked a lemon from one of Farny’s lemon trees. He threw it on the ground. Farny gasped. “Those are my lemons. Don’t you dare touch them! I’ll show you.” The rabbit pulled another orange from the tree. Jiggles gasped again. He picked another of Farny’s lemons. 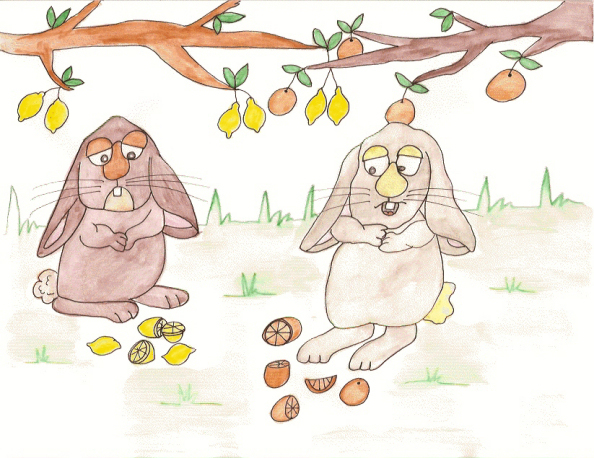 For the next hour the two rabbits plucked fruit from each other’s citrus trees, throwing them all over the ground. When there were no more oranges or lemons to pick, they stopped. Both of them stood staring at the ground. Farny turned and looked at his lemon tree. A tear ran down his face. He bent over and started picking up his lemons. Jiggles looked at his orange tree. A tear ran down his face onto his whiskers. He started picking up his oranges. When their arms were full they carried off their fruits without saying a word to each other. That night Jiggles sat in his burrow admiring and sniffing his oranges. He heard a noise. When he stuck his head out of the hole, there stood Farny. In his hand he held a pitcher of lemonade. Farny thought that was a good idea. The two rabbits never fought again.